Come hop aboard the possum bus! 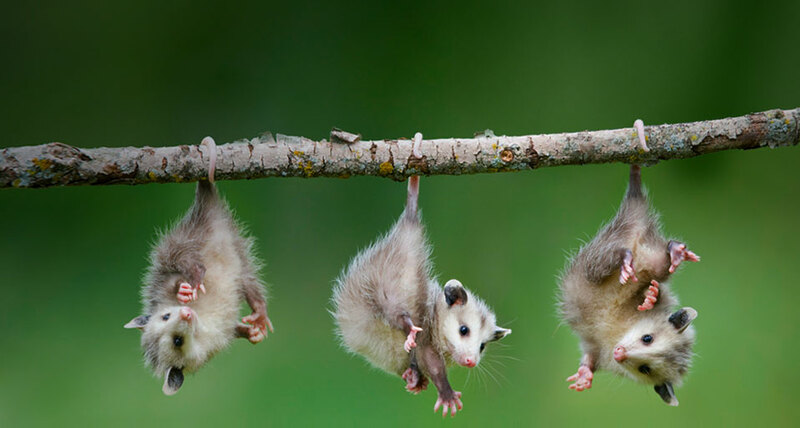 This marsupial can hang upside down from its strong tail, (which is impressive) but cannot run very fast. It does not have big teeth or claws to defend itself against predators (animals that might want to eat the possum). If it feels that danger is near, sometimes it will lay down and play dead. It does not decide to do this; it is for the possum, a bit like fainting. It happens naturally when the possum is frightened. It even produces a rotting smell that helps to convince predators that the animal has been dead for too long to make a tasty meal. 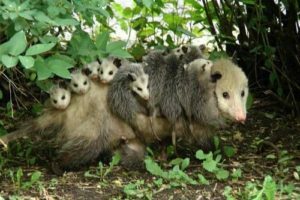 The mom-possum is strong and takes care of her children by letting them ride in her pouch when they are small. When they have outgrown the belly pouch, they crawl up onto her back to get a ride through the forest on the momma-bus. 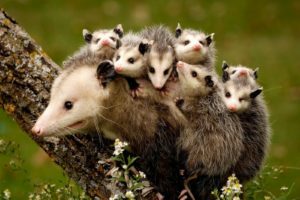 A mother possum can carry up to fifteen baby possums as she trundles through the forest highways and byways.